Amanda Catron, a Master’s candidate in French, will serve as the TA for the Avignon Study Abroad Program this spring. 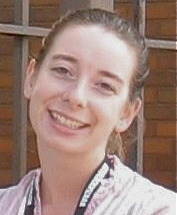 She was chosen from a strong field of candidates to assist the director of the program, Christophe Corbin. Amanda will assist Fred Toner in the ML 249B course in winter quarter, working to prepare the participants for life in France. In Avignon, she will teach ML 250B to help students better understand the culture and profit from what the study abroad experience offers. 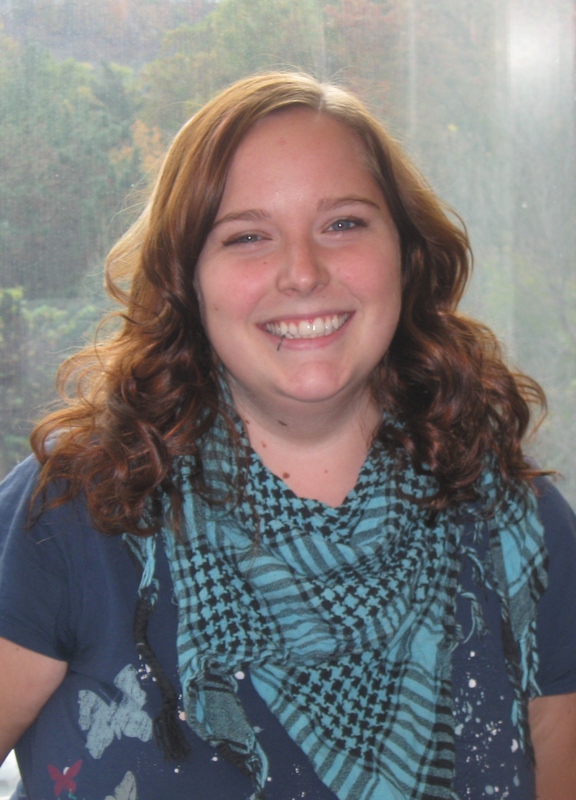 Amanda’s experience teaching at Ohio University and in France will serve her well in her new position, as will her experience as a Resident Assistant during her undergraduate years at O.U. Stuart John Ross, 21 years, of Canton died unexpectedly on Wed., Sept. 1 in an automobile accident out-of-state. Stuart was born Nov. 18, 1988 at Timken Mercy Hospital, attended Growing Years Nursery School through 1995, attended Mason Elementary from Kindergarten through 3rd grade and Avondale Elementary in fourth and fifth grades. Stuart attended Taft Middle School and was a 2007 graduate of GlenOak High School. 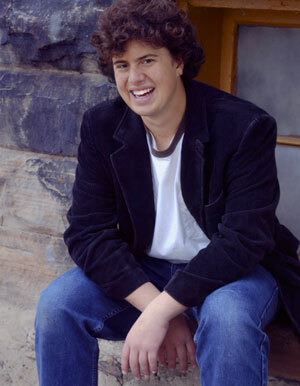 He was enrolled to attend his fourth year in the Arts and Sciences College, working toward a certificate in Italian Cultural Studies, at Ohio University in Athens, Ohio at the time of his death. Stuart is survived by his mother Sarah Hayden, father John Ross, his sister Olivia Ross, stepmother Kathleen Ross and his stepfather James Hayden, all of Canton, Ohio. He is also survived by stepbrothers Ben Hayden of Ft. Myers, Florida, Marshall Hayden of Tampa, Florida, Tyler Hayden of St. Petersburg, Florida and stepsister Sarah Stecher and Godparents, Linda Croston of Navarre, Ohio and Michael Pinney of North Canton, Ohio. To celebrate Stuart’s life, his creativity, his love of history, music and sports and of course, a good joke, a memorial service will be held Sun., Sept. 5, 2010 at 5:30 p.m. at St. Mark’s Episcopal Church, 515 48th Street NW, Canton, Ohio 44709. A gathering in the Narthex provided by the Church will follow. In lieu of flowers, please consider a contribution to honor Stuart’s life and pay-it-forward for other students of Italian language to the Stuart Ross Study-In-Italy Scholarship fund through the Ohio University Foundation, PO Box 869, Athens, Ohio 45701. These faculty members will be formally honored at the college’s New Faculty Welcome and Awards Ceremony at 4pm on Sept. 14, 2010 in Baker Center Ballroom A. Please mark your calendars. Bärbel Such: German – Bärbel has been chosen to receive the 2009-10 Jeanette G. Grasselli Brown Faculty Teaching Award in the Humanities. 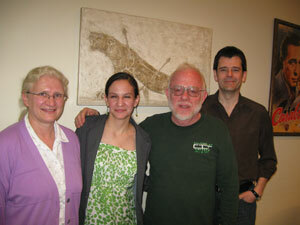 Vera Belousova: Russian – Vera has been chosen to receive the 2009-10 Dean’s Outstanding Group II Faculty Award. Mary Jane Kelley: Spanish – Mary Jane has been chosen to receive the 2009-10 Dean’s Outstanding Faculty Undergraduate Advising Award. The DML is pleased to announce that Lillian Rutana, 2nd year French TA, has been awarded the Outstanding TA for 2009-10 in French. Congratulations, Lillian! 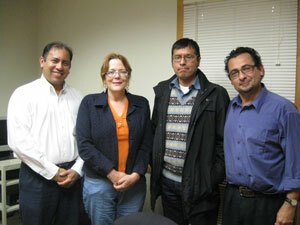 Hispanic Literature at the University of Illinois at Urbana-Champaign with a Graduate Teaching Assistantship. Way to go, Sarah! Science for the summer 2010. She will be collecting data on the implications of surveillance technology, such as cell phones, in an increasingly technologically advanced world. ¡Felicidades, Mary! Congratulations to these Spanish instructors on successfully defending their Latin American Studies theses: Tatiana Argüello, Melissa Myers and Hernán Medina. Modern Languages Spanish instructors participate in are play: Tú acuérdate que yo quiero olvidar” by Elaine Romero. Liliana Alvarez, Carolina Novella, Sarah West and Luis Rejano Flores along with several students performed an elegant dramatic reading of this play at an area theater. 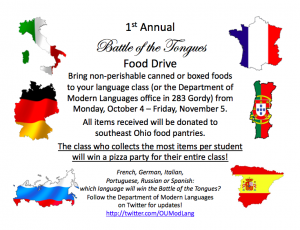 The Department of Modern Languages played a large role in the success of the Ohio Foreign Language Association’s annual conference, April 8-10, at the Hyatt on Capitol Square in Columbus. Fred Toner, OFLA’s president, greeted more than 600 participants and exhibitors to what has become one of the country’s largest state language conferences. 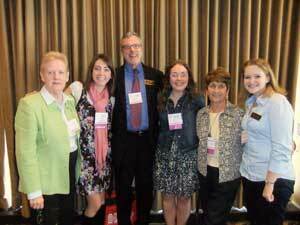 Eileen Glisan, president of ACTFL, gave the keynote address and presented a three-hour workshop. Among O.U. faculty giving sessions were Barbara Reichenbach (“Integrating Culture Into Every Lesson”), Francia Martínez (“Learning Vocabulary Can Be So Much Fun: Interactive Vocabulary Games for Elementary and Intermediate Levels of Spanish”), Dominique Duvert (“Parlez-vous business?”), and Lois Vines (“Astérix and the Visual Arts”). Nick Sathe, president of the state AATG, presided at a “Meet & Greet” for German teachers and helped organize a workshop sponsored by the Ohio AATG. 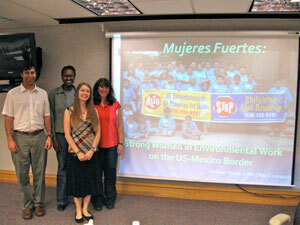 Two HTC students mentored by Lois Vines presented papers, as well. Caitlin Yocco discussed “The Second World War and the Holocaust in French-Language Children’s Literature,” and Nicky Re investigated “Occitan in the Hexagon: Preserving France’s Cultural Diversity through the Teaching of Regional Languages.” A former O.U. student, Kate (Burin) Isaacson traveled from Chicago where she currently teaches to present her session (“Foreign Language: More Important than Breakfast!”). Kristina Maurer and several other former students were also in attendance. We can be proud of our department’s strong showing. Jaime Espinoza Moore and Emilia Alonso Marks presented a paper entitled “Heritage Spanish Speakers in School Settings: Are We Meeting the Needs of These Students?” at the 11th Biennial International ELIA Conference: Bilingualism and Multilingualism in School Settings. 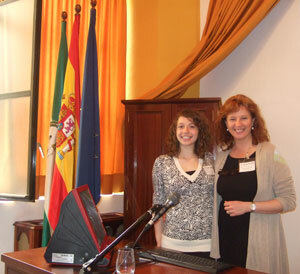 The conference took place on March 18th and 19th, 2010 at the Universidad de Sevilla, Spain. Spanish prof Daniel Torres’ latest book of poetry, De bellaqueras, has attracted both national and international attention. Daniel has been invited to read and present his poetry at the Claremont Colleges in California, Festival de la Palabra in San Juan, Puerto Rico, and now at De Paul University in Chicago.